Some anime aspire to greatness: ambitious themes, epic sagas, references to literature, religion, and mythology. And some shows, like Code-E, are the wallflowers of the season: seemingly unassuming, modest, soft-spoken and having few goals but to tell a decent story with decent characterization. Just like, in a way, its bespectacled protagonist, Chinami. She wants nothing more than to handle her walking EMP-bomb powers and to understand the bubbling feelings inside her for Kotaro. The show’s job is to simply take us to those destinations with her, and it does so with imperfect charm. This production is a change in tone from the studio that helped produce Read or Die, an arguably more dynamic and wittier franchise. It begins as a comedy, low-key most of the time (except for the final line of episode 1, which is uproarious), and only very late tries to introduce dramatic elements–and, in my opinion, it does so clumsily and with some clear signs of rushed resolution. 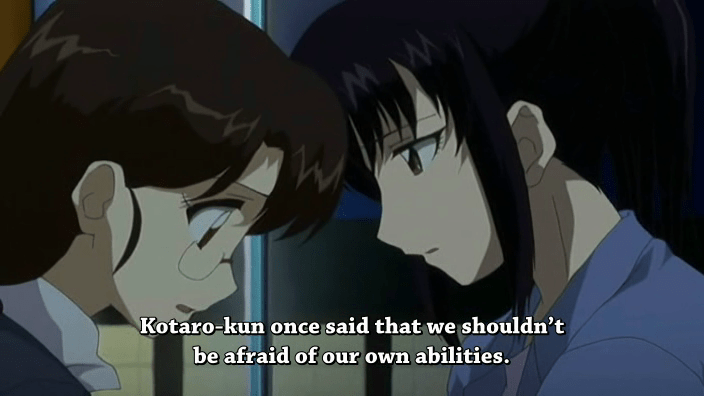 RoD was held together in the OVA purely on the strength of Yomiko Readman, who is such an appealing character both for her clumsiness and for her utterly unique and funny power. Chinami’s power is, to my mind, not as unique or as compelling as a plot device, and the attempt to turn it into the one felt both half-hearted and pedestrian. They would have done better had they gone the route of Kimagure Orange Road, where the psychic powers of the main male protagonist was incidental to the meat of the story, the love triangle. Which for a good part of Code-E, seemed to be what was going on. Which brings me to the other characters, mainly Kotaro and Sonomini. I liked how Sonomini grew as a character throughout the series. 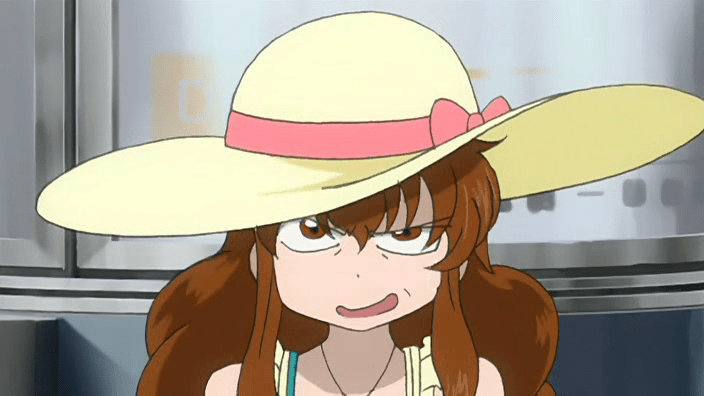 She starts as the “jealous bitchy tsundere” type, a role arrogated typically to the “childhood friend” characters–which she is. However, as we find out more and more about her background–her wealth, her connections, her family situation–I began to warm up to her. She is actually the best developed character other than Chinami herself, better than Kotaro, who begins as a cheerful science geek and ends as a cheerful science geek. One notable thing though that is often absent from much anime is how prominent Chinami’s parents, especially her father, play a role in her life. Of course her father is portrayed as a writer bumming around the house in a Hawaiian shirt and ukelele–the opposite of your typical workaholic Japanese dad who’s never home–and it may have something to do with the fact that Chinami’s status not only as a walking EMP bomb but also as an only child that contributes to how close and relatively harmonious this family is. So much anime, aimed at teens especially, is a fantasy of a world mostly without parents and adults. It’s nice to see something different on that score for a change. The show is not without its flaws, though, and they are serious ones. I often got the feeling that there was a much bigger story which either couldn’t be shown due to budget constraints, or simply has been shunted off to another season, but this is a story with so many loose ends. 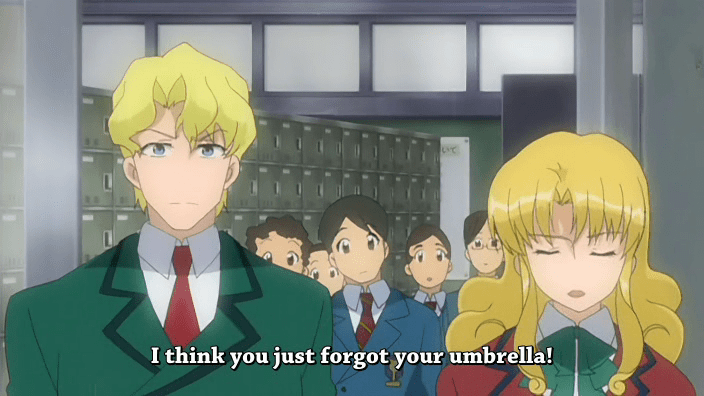 The German twins, for instance, clearly have their own backstory and reasons for trying to find out more about Chinami’s power, but they mostly serve as comic relief in the show–comical music even plays in most of their scenes. Now I understand this technique, of introducing comical villains to pave the way for the real ones–Miyazaki did it masterfully in Laputa. But the real “villains” at the end of this show are relatively toothless and more importantly, given very little motivation and rationale for their actions. The spy music of the OP promises a lot more than it delivers on that score. This is not a spy, action, or conspiracy show, and when it tries to be, it fails. There are actually two love stories going on in this story, and the main one is not resolved satisfactorily. The most prominent one of course is the Chinami-Kotaro-Sonomi love triangle. Sonomi has been in love with Kotaro from the start, has been jealous at every appearance of Chinami, and is constantly heartbroken every time the truth about Kotaro’s feelings becomes clearer and clearer. 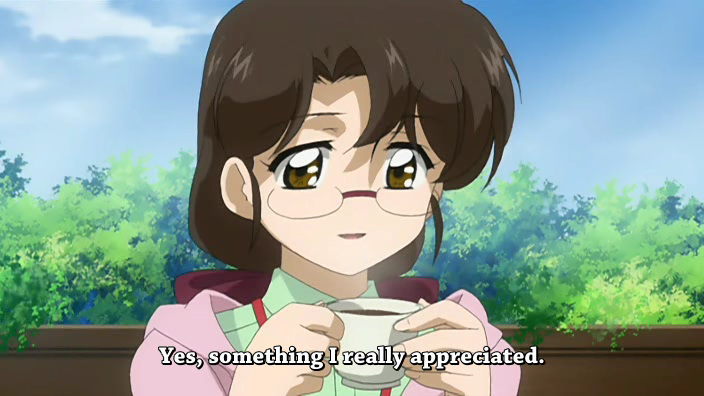 Her change of heart in episode 12, where she smiles as she tells Kotaro to go after Chinami, is both sudden and unbelievable. Just one episode prior, she had been crying at the thought of him going to Chinami. It’s not like her to back down so thoroughly. A simple change–smiling through tears–would have mitigated it considerably. They chose not to do that. The other love story–and I realize this may be a controversial proposition–is the one between Chinami and Yuma, the shrine maiden who too has a similar power to Chinami. Like Sam and Frodo, it is not a sexual or a romantic relationship per se, but their bond is also unusually close, probably because of their shared powers and their desire to control them. The training situation is a natural way for a close friendship to develop, and Yuma and Chinami are alike too in their quiet and unassuming natures. The point where it becomes, to me, a kind of love story is near the end, as Yuma too loses control of her powers and at last expresses fear and doubt behind her implacable exterior. It’s one of the more moving pars of the show, and itself could have carried more emotional heft than it did. It was clearly intended to be secondary to the main love triangle. The series really needed one more episode: one more episode to explain certain character changes as well as plot points. Finally, there is the thematic consideration and the genre this show ultimately falls in. Is this a romance? A comedy? A sci-fi exploration? At times it wants to be all things to all people, and I think that’s the heart of the problem and the promise of this show. The strongest parts for me were the quieter ones: the simple relationship dynamics, the moments Chinami shared with her parents, the awkward moments with Sonomi and Chinami as they try to sort out their feelings about Kotaro. There is nothing here of course that hasn’t been handled with more nuance in other shows, but when the focus was on the main trio of characters, the action and emotional register felt balanced and well-paced. But the writers seemingly couldn’t decide whether to make this a show where Chinami’s power was mainly a symbol for teenage awkwardness–a means to a character end–or something which in itself was interesting and hence a whole sci-fi conspiracy plot. And so the show seems to waver, to try to walk a very thin tightrope from which it eventually falls off. Multiple times, and on different sides. I think we need more shows that try to do what this show is trying to do at its best; it’s the very definition of a “sleeper hit,” a show that tries to tell a fun and unique story about decently drawn characters. The problem is that the elements and the moments just don’t quite gel and at times feel rushed to a forced conclusion. I stated initially that the show seemed unassuming and modest, and the key word there is seemed. The problems really start showing up when the writers aspire to something more than a “love story but with powers” and try to mix other genres in. They were, in short, perhaps a bit too ambitious. Given the amount of talent in Studio DEEN, and that this is a rare example of a purely original anime (no manga or light novel stands behind this story), I think they can do better, and sometimes to do better is go smaller. They too have got to learn to control their powers. Animation: 80%. Competent, with cute character designs especially on Chinami, who really does look like Yomiko Readman’s little sister in so many ways. On par with any current TV series. Music: 90%. Frequently quite good: a quiet guitar piece in particular, while somewhat overused, captured nicely what this show feels like at its best: reflective, languid, and peaceful. The ED is also above-average, with lyrics that capture the show’s mood and a catchy melody. 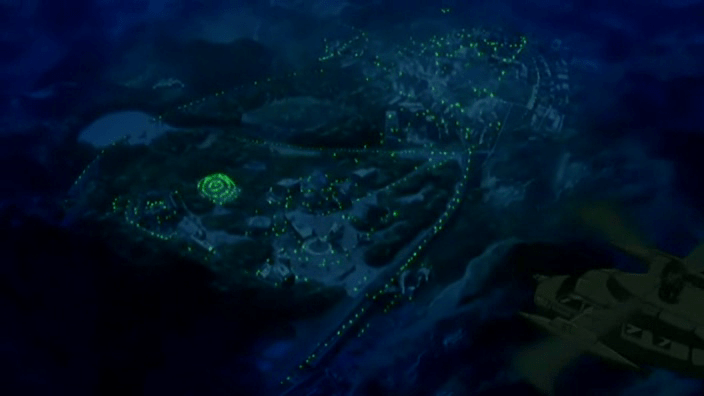 However, the OP was clearly made to resemble Read or Die‘s, and is woefully inappropriate for the show. Story: 75% promising elements, particularly the near-future setting. The characters are all likable, except for the annoying German twins. But see the story problems noted above. The ending in particular was rushed. Overall RDA: 78%. Watch it on a rainy afternoon when you need a quick, pick-me-up; it’ll make you feel good, and you might even laugh. Or watch it if you’ve been having electrical problems lately. I have this theory that they plotted it for 24 episodes, then got as far as episode 10 and were told “Oh, by the way, only two more episodes to go guys.” and had to come up with an ending quick. At least, that’s the only reasonable way I can think of to explain how so much potential and so many plot devices were just abandoned. Dop–that sounds about right. My guess is that there’s somebody in Studio Deen who’s very, very upset or saddened at the final outcome. It was clear they wanted to do so much more than they actually did. Some shows give you really tight storytelling. Some give you lots of action. Some give you tension and character development that’s on par with some of the best writing ever to see the light of day. Other shows, like Code-E, give you moments that leave you feeling warm, sometimes happy, sometimes a little sad. The show suffered from all of the flaws mentioned in the article and it’s a shame it wasn’t presented as a 24 episode series so it could have reached its full potential. However, I’ve watched it five or six times, now, and each time it’s always been worth the moments when the background music blends well with the dialogue and the moving bits of sentimentality. Even with its flaws, it a show that I’ll keep and keep watching when I want some moments of warmth and a smile. William: actually, I pretty much agree with you there, though it’s been a long while since I last saw this show. A later season, Mission-E, I think tried to fill in some of the gaps, though it seems they changed to a more action focus and I didn’t find it as heartwarming or entertaining as Code-E. At its best it was a charming little show and was one of the more likable shows of the season.